Unsure? Want to learn more? Come to a FREE Ride Across Wisconsin Ride Info Night! Learn about the ride, the route and ask questions about this epic new challenge! Hear from riders who have participated in the past, and learn tips & tricks on how to train. Plus, everyone who joins for an info night gets 10% off their registration*! ALL are welcome: already registered riders, curious cyclists, or people who are interested in helping out or volunteering! *10% discount on the regular priced registration fee- excludes early bird pricing. Not applicable with other discounts. 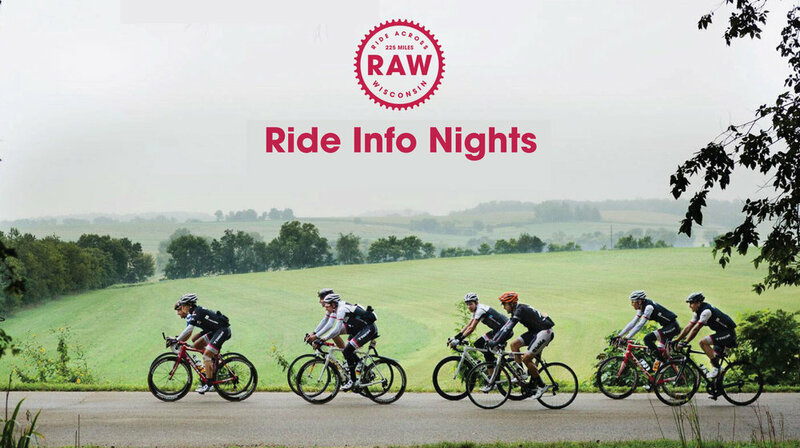 Interested in Hosting a RAW Ride Info Night? Fill out this form!